arch-peace editorials: Architectural Aspirations of an Emerging Regional Metropolis, Doha-Qatar. Architectural Aspirations of an Emerging Regional Metropolis, Doha-Qatar. An emerging regional metropolis in the Gulf region is clearly on the rise. Doha, the capital of Qatar keeps positioning and re-positioning itself on the map of international architecture with different degrees of expressions of its unique qualities in terms of economy, environment, culture, and global outlook. I call these expressions “manifested architectural aspirations.” In this composition, I select some of these aspirations that can be seen as conscious endeavors of relating an exclusive local context to the global world. The “World City Network” of Taylor ranks Doha as a Qatari city with the highest global connectivity (1). Doha’s man-made deepwater port serves as a regional container and transshipment point which handles cargo across the Gulf. Doha has an inner-city international airport with one runway which is currently running out of capacity given the recent rapid growth of the city. A new airport further outside the city with two runways (planned to be finalized by 2011) and a new international seaport (planned to be finalized by 2014) are currently under construction (2). While these developments represent important economic and infrastructure efforts, Doha’s aspirations in architecture should be underscored. Historically, Doha was a fishing and pearl diving town. Today, the capital is home to more than 90% of the country’s one million people, the majority of whom are professionals from other countries. Up to the mid 1960s, the majority of the buildings were individual traditional houses that represent local responses to the surrounding physical and socio-cultural conditions. During the 1970s Doha was transformed into a modernized city. However, in the 1980s and early 1990s the development process was slow compared to the prior period due to either the overall political atmosphere or the heavy reliance of the country on the resources and economy of neighboring countries. Over the past decade or so, Qatar has become one of the major producers and exporters of Liquefied Natural Gas (LNG) in the world. The wealth produced by Qatar's oil and gas exports has generated a construction development boom in the capital, Doha, and the surrounding vicinity. This resulted in significant growth at all levels from urban development and infrastructure provision to cultural and educational facilities. Doha has recently acquired a geo-strategic importance. Through the shift of global economic forces, it is being developed as a central hub (together with other major cities in the region) between old economies of Western Europe and the rising economies of Asia. In the context of international competition between cities new challenges are emerging. Cities need to find ways to sustain and extend their position in the context of a global knowledge economy. No doubt, architecture and the overall urban environment are tools that help cities survive in the global competition of geographic locations. Like its neighboring growing capitals, Doha has ambitions and aspirations and, in attempting to position itself on the map of world emerging economies, its architecture is continuously materializing its aspirations. These are not only statements of forms and architectural compositions made by name architects, but serious ventures that speak to the environment and culture with different degrees of success (3, 4). Fig 1. Doha Skyline: Waterfront architectural aspirations (source; Ashraf Salama). 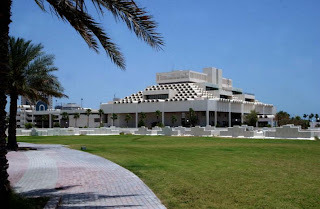 Notably, architectural aspirations in Doha are not new, early examples of which include Qatar University (QU) Campus and the Central Post Office. QU campus is one of the early attempts to establish a local architectural identity designed by the Paris based Late Egyptian architect-Ahmed El Kafrawi. 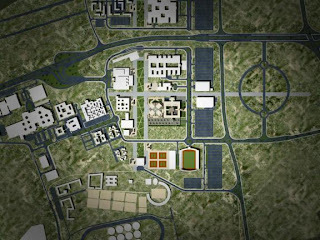 The campus is located on an elevated site 7 km north of Doha in Al Markhiah District and 2 km from the Gulf shore. It accommodates a central library, an administration building and an information technology centre; five college building sections; student activities and sport and recreational facilities; educational technology building; and central services units. Based on an octagonal unit design idea wind-tower structures are designed to provide cool air and reduce humidity. Towers of light are also introduced and are intended to control the harsh sunlight, and abundant use of mashrabiyas (Traditional Screened Windows) and some stained glass also serve to mediate the environment. Open and partially covered courtyards, planted and often with fountains, are plentiful throughout the site. The architect placed strong emphasis on natural ventilation, one of the many links in which he relates to traditional architecture of the region. As specific models he used the few still existing wind-tower houses in Doha and modernized their basic principle. Inaugurated in 1988, the main structure of the Q-Post (GPS-General Postal Corporation) is another aspiration from the eighties. It was designed to accommodate modern technological equipment in order to achieve an advanced and efficient postal service. The building was designed as a pigeon loft to symbolize pigeons which were used to send messages in ancient times worldwide. Reducing the amount of solar gain through deep openings while utilizing dramatic effects of day lighting are major design features. The Qatar Foundation for Education, Science and Community Development was founded in 1995 by Emiri Decree. This was one of the early initiatives of H. H. Sheikh Hamad Bin Khalifa Al-Thani, chaired by H. H. Sheikha Mozah Bint Nasser Al-Missned, a testimony of their commitment to education and research. From its inception, the mission of the Qatar Foundation has been to provide educational opportunities and to improve quality of life for the people of Qatar and the region. Truly, this was reflected in developing a higher education campus—an education city—adopting the branch campus concept - world-class universities bringing their best-regarded programs to Qatar as full-fledged partners with Qatar Foundation. This is unique in the history of education and believed to be the first precedent worldwide. In essence, the Education City is a university of universities, a higher education and research community of institutions that serve the whole person. One statement of a manifested aspiration is that of Arata Isozaki who is well known for his deep interpretation of the contexts in which his designs are developed. He designed the Liberal Arts and Sciences building (LAS) which is a focal point for all students in the Education City. Occupying an area of approximately 22000 m2 the building is introduced to accommodate the Academic Bridge Program-ABP; a preparatory program for enhancing the academic background and experience of high school graduates from Qatar and other countries in the region. The ABP addresses the universal problem of student academic and cultural transition from high school to the university. As a visually striking and architecturally stunning intervention, the building is designed around a theme developed from traditional Arabic mosaics that are evocative of the crystalline structure of sand. This was based on intensive studies to abstract the essential characteristics of the context while introducing new interpretations of geometric patterns derived from widely applied traditional Islamic motives (5). Another manifested aspiration of Isozaki is witnessed in Weil Cornell Medical College, a striking functional composition of courtyards, bridges, and polyhedrons and ovoid lecture halls. Reflecting the locality, a combination of triangular and square shapes are used for openings, partitions, and other vertical surfaces. These were traditionally used in Arabic-Islamic decorative arts utilized in houses and public buildings. A third selected statement of a manifested aspiration is that of the AIA Gold Medal award winning Ricardo Legorreta who continues in his design of the Engineering College of Texas A & M University to root his work in the application of regional Mexican architecture to a wider global context by amalgamating local traditions with contemporary needs. Legorreta uses elements of Mexican regional architecture in his work including bright colors, plays of light and shadow, central patios, courtyards and porticos as well as solid volumes. Over a construction period of 19 months and on an area of 53000 m2 the College was opened in 2007 with a total capacity of 600 users including students, faculty members, and administrative staff. The concept is based on introducing two independent but adjoining masses linked by a large atrium; these are named the Academic Quadrangle and the Research Building. The overall expression of the building demonstrates masterful integration of solid geometry and a skillful use of color and tone values. Accessibility is well articulated where five main entries that lead to the inside of the building are introduced; two are pedestrian entries, a car and vehicle entry, service entry and finally entry tower. The lower floor accommodates car parking, locker rooms and ancillary requirements (5). The remanufacturing or reconstruction of Souq Waqif represents another manifested aspiration of conserving the past of a nation. The literal translation of the area is “The Standing Market,” a Souq with an old history said to span across 200 years. It contained different types of sub-markets for whole sales and retail trades, with buildings characterized by high walls, small windows and wooden portals, and also open air stalls for local vendors. Bedouins used to hold their own markets on Thursdays selling timber and dairy products. Also, it was a gathering space for fishermen. Over a period of three decades from the sixties, the Souq was derelict and most of its unique buildings fell in despair (6). Recently, it has acquired a new image by returning it to its original condition. However, while it kept its function, new arts galleries, traditional cafes and restaurants, cultural events, and local concerts were introduced as new functions attracting most of the city residents and visitors. A Large Scale Aspiration of Urban Regeneration and a Unique Architectural Language. Dedicated to reflecting the full vigor, complexity and multiplicity of the arts of the Islamic world, the Museum of Islamic Art collects, preserves, studies and exhibits masterpieces spanning three continents (Africa-Asia, Europe) from the 7th to the 19th century. 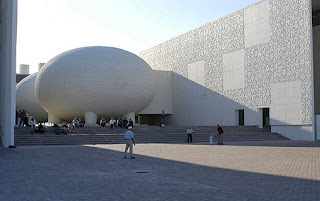 The Museum is the result of a journey of discovery conducted by I.M. Pei—the designer of the famous glass pyramid of the Louvre in Paris, Pei’s quest to understand the diversity of Islamic architecture led him on a world tour. Influenced by the architecture of Ahmad Ibn Tulum Mosque in Cairo, the museum is composed of two cream-colored limestone buildings, a five-story main building and a two-story Education Wing, connected across a central courtyard. The main building’s angular volumes step back as they rise around a 5-story high domed atrium, concealed from outside view by the walls of a central tower. An oculus, at the top of the atrium, captures and reflects patterned light within the faceted dome (8). As a leading non-conservative modernist, also influenced by the views Walter Gropius brought to America, Pei succeeds in translating the cultural aspirations of a country into a true architectural manifestation that speaks to world architecture while addressing demands placed on the building by the context exemplified by local culture and environment. It seems that Doha’s aspirations are endless and this is evident in the current surge in the design and construction of new buildings. But, why have I called the preceding selected architectural endeavors “Manifested Architectural Aspirations.” Simply because they represent physical and intellectual statements made by enlightened clients and responsive name architects. They are not physical masks of power, but embody a considerable number of the forgotten enduring values of architecture. These can be exemplified by different factors. They respond to the contextual characteristics mandated by climatic and symbolic attributes. This is manifested in different treatments and articulations addressing sun movement and air flows around the buildings, the use of durable and reflective materials, the dramatic effects of natural light in the interior spaces, the orientation of openings or double walling and skylights, and the deep interpretation of traditional elements and their adaption in contemporary use. With different degrees of success they respond to the needs of users and local populations, to the city and also to the artistic and spiritual needs of the people. They emphasize the role that human values play in creating responsive environments by skillfully addressing the clear separation between gender related activities. They integrate building management systems into new interpretations of traditional forms. They adopt flexibility of use and as an important factor for expansion in the cases of educational buildings, they adopt the integration with distinction of activities providing clear spatial organizations. They emphasize the visual and physical dynamics of users' activities at the horizontal and vertical levels. While these manifested aspirations represent cognizant actions of architects toward creating responsive educational, cultural and commercial environments that meet the aspirations of enlightened client organizations and their communities, it remains to be seen how new aspirations would fit in harmony—visually, spatially, and functionally—with these already discussed and with the overall city form; an issue that could generate another future discourse. 2) Alain Thierstein and Elisabeth Schein, (2008). "Emerging Cities on the Arabian Peninsula: Urban Space in the Knowledge Economy Context," in ArchNet-IJAR: International Journal of Architectural Research, Volume. 2, Issue 2, Archnet- MIT Design Media Lab, Cambridge, USA, PP. 178-195. 3) Ashraf M. Salama, (2008) Doha: Between Making an Instant City and Skirmishing Globalization. Special Edition of Viewpoints, Middle East Institute, American University, Washington, DC. United States, PP. 40-44. 5) Ashraf M. Salama, (2008). Innovation meeting Aspiration: Isozaki and Legoretta in the Midst of the Education City Campus, Qatar. MAGAZ Magazine, Issue 101, MAGAZ Magazine, Cairo, Egypt, PP. 76-83. 8) Philip Jodidio, (2009). Museum of Islamic Art, Doha, Qatar, New York, NY: Prestel. Dr. Ashraf M. Salama is member of the editorial board of Architects for Peace. He is an architect, scholar, and professor of architecture, He is the Chair of the Departmewnt of Architecture and Urban Planning at Qatar University, has held a reader in architecture position at Queen’s University Belfast, United Kingdom, and is the chief editor of Archnet-IJAR: International Journal of Architectural Research, collaborating editor of Open House International-OHI, editorial board member of Time-Based Architecture International, and International Journal of Environmental Research and Public Health. I am an artist living and working in Qatar. My new series of work called 'Cloud Dance Over Qatar' are acrylic paintings on canvas, and each painting features one architecturally beautiful building or public structues in Qatar. I plan to produce photocopies of my painting description, for my upcoming art exhibition in Cafe Ceramique at The Mall. Please let me know if you grant me permission.